Go BOLD this holiday season in Beverly Hills with their second annual event full of music, art and more. 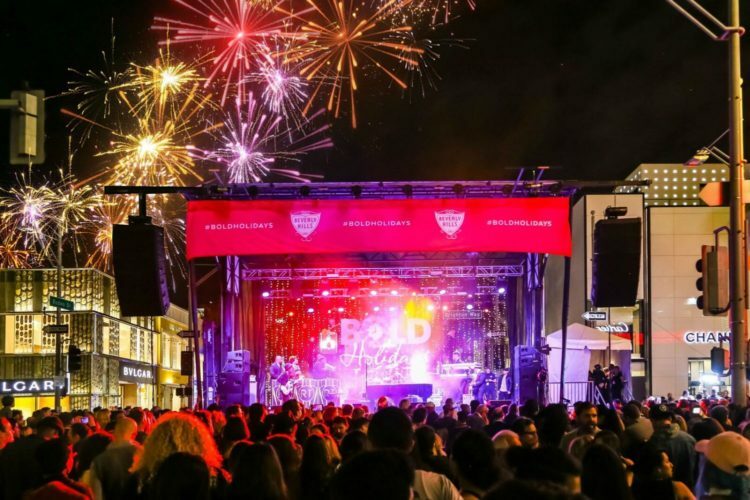 On Nov. 15 from 5 to 8:30 p.m., the BOLD Holidays campaign will kick things off with the Rodeo Drive Holiday Lighting Celebration. Hosted by Dawn McCoy, the night will feature live music from electro hip hop violinist and America’s Got Talent contestant, Svet, and a specially curated 20-piece #BOLDBH band playing a mix of holiday classics and decades hits. A dramatic unveiling of the lighting and decor will reveal new social art installations and debut Alexa Meade’s solo exhibition. There will also be a Champagne garden, food trucks, a fireworks show and more. Guests can enjoy the BOLD Holidays celebrations every Friday and Saturday from 5 to 8 p.m. through Dec. 22. The events will take place on the 200, 300 and 400 blocks of Rodeo Dr. and throughout the city. Along with lights and festive programming, guests can enjoy later shopping hours, #BOLDBH California snowballs, a live ice sculpting experience, an interactive peace wall, ballerinas performing on grand pianos, contortionist fashion and more. Alexa Meade, whose recent work includes painting Ariana Grande in her music video “God is a Woman,” will create a 3D art installation on Rodeo Dr. that will appear to be 2D when photographed. Visitors stepping into an immersive art exhibition will become part of the artwork as they don hand painted clothing and accessories. Catch Meade painting live models on Nov. 15, 30 and Dec. 14. BOLD Holidays will also feature the West Coast debut of QuinCoach’s motorcyle coaches on Dec. 14, 15, 21 and 22 (one featuring 50,000 sparkling crystals), the return of BOLD rides throughout Beverly Hills’ in exotic and luxury cars provided by Midway Car Rental; live holiday music in Beverly Canon Gardens and holiday art walks lead by curatorial professionals.